The Afghans won by seven wickets in Dehradun. It is a well-known fact Afghanistan President Ashraf Ghani is a die-hard fan of cricket. During the Indian Premier League (IPL) last year, Ghani even said jokingly that Afghanistan was not going to give away its star player Rashid Khan after the spinner came up with impressive performances in the tournament. On Monday, Ghani congratulated the Afghanistan team on their maiden Test victory and it was acknowledged by Rashid. Ghani congratulated the Afghanistan team for its win and said it was a pride to see the “steadfast rise” of the country’s cricket team. In reply, Rashid said the president’s encouragement always gave them positive energy. Afghanistan came up with a spirited performance against Ireland in what was their second Test. They played their maiden match against India in Bengaluru last year but was hammered on that occasion by an innings and 262 runs. They met Ireland at Rajiv Gandhi International Cricket Stadium in Dehradun and came up with a spirited performance to win the match by 7 wickets. Afghanistan bowled out the opponents for only 172 on Day 1 and it became that much easier for them to take control of the game from there on. Ireland came up with a fight but eventually, their target of 147 was not difficult for the Asians to overhaul on Day 4 of the match. For Ireland, it was the second loss in as many Tests after their 5-wicket defeat against Pakistan at home last year. 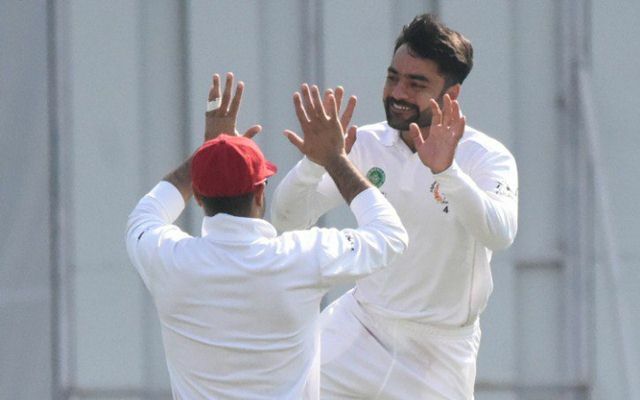 Rashid, who had an ordinary outing in the Test match against India last year, came up with a brilliant performance this time, taking seven wickets in the game for 107 runs. He played a crucial role in the second innings by running through Ireland’s middle-order that prevented them from taking a bigger lead. The Man of the Match award though went to opener Rahmat Shah who hit 98 and 76 in the two innings and almost became his side’s first centurion in the longer format.